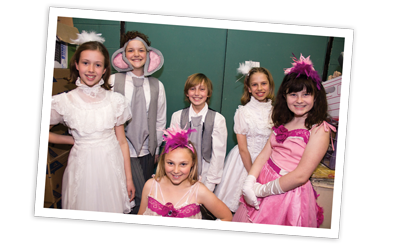 Asheville Community Theatre offers Youth Production Classes for K-12 students interested in learning the ins and outs of participating in a big production and specialized classes like Broadway Bootcamp, Youth Improv, Youth Acting, and Youth Filmmaking. All types of classes offer a performance component for a finale! Three performances will be held on the ACT Mainstage. The performance schedule is March 15, 2019 at 7:30 pm and March 16-17, 2019 at 2:30 pm. Set in Damon Runyon’s New York City, Guys and Dolls JR. follows gambler, Nathan Detroit, as he tries to find the cash to set up the biggest craps game in town while the authorities breathe down his neck; meanwhile, his girlfriend and nightclub performer, Adelaide, laments that they’ve been engaged for fourteen years without ever getting married. Nathan turns to fellow gambler, Sky Masterson, for the dough, but Sky ends up chasing the straight-laced missionary, Sarah Brown. Guys and Dolls JR. takes us from the heart of Times Square to the cafes of Havana, but everyone eventually ends up right where they belong. Three performances will be held on the ACT Mainstage. The performance schedule is May 3, 2019 at 7:30 pm and May 4-5, 2019 at 2:30 pm. Our popular class that spotlights the fabulous world of Broadway. You’ll learn good audition technique, how to play to your strengths, how to build an actor’s resume and learn appropriate theatre etiquette. Also on board will be a seasoned Musical Director and Choreographer to improve your singing, dancing and acting techniques so you can be a real “triple threat.” The finale of this class will be a cabaret style of weekend performances featuring all class participants in a Broadway showcase featuring solos, duets, trios and company numbers from the musical theatre songbook! Directed by Mark Jones. This class will include instruction on improv skills, including character development, connecting in scenes, “Yes and…” acceptance technique, and building the beginning, middle, and end of a scene. We will play a variety of fun and interactive improv games, including Freeze, Murder Mystery, Props, Styles, ABC game, Changing Channels, Survivor, and Slide Show. Some of the games will be similar to the show, Whose Line it Anyway? The last class will be open for parents to watch a mini improv show to demonstrate the games and skills learned during each class. This class is open to all levels of improv from beginning to advanced. Taught by Chris Martin who has directed over 50 youth productions in Asheville. He studied adult improv and he was part of an improv troupe called the Oxymorons for 3 years. He has taught youth improvisation and creative drama classes for students ages 4-16 for over 18 years. He is a local 8th-12th grade theatre arts teacher at Franklin School of Innovation. He currently directs Chuckleberry Finn, his own Asheville youth improv troupe who perform at The Hop North once a month. He holds a Masters degree in Theatre Education and K-12 Theatre Arts Teaching Licensure from UNC-Greensboro. In this class, students will learn a variety of acting techniques with a focus on character development and relationships, deciding what your character wants and how you are going to achieve it, and making choices in scenes to fully develop the scene with specific blocking and movement. Students will work on scenes and monologues from a variety of popular youth plays and musicals, including Charlotte’s Web, Peter Pan, Into the Woods, The Secret Garden, and Beauty and the Beast, taking them from auditions to performance. They will also write their own original, creative scenes to perform in a final showcase during the last class. Taught by Christine Eide, who has been assisting with the ACT youth acting and improv classes over the past couple of years. Christine has over 20 years of experience as an actress, director and teacher. She has performed with several local theatres such as Bright Star Touring Theatre, Asheville Lyric Opera, The Magnetic Theatre, Different Strokes! Performing Arts Collective and Ellipsis Theatre Company. She has directed shows for both youth and adults, her most recent being All in the Timing at Odyssey Community School and Night Music at The Magnetic Theatre. In addition, Christine has taught several acting classes in both the US and Ecuador where she co-founded Azuay Community Theatre. She has a BA in Theatre Performance and Music as well as a M.Ed. in Curriculum and Instruction. Our popular summer camp class in now available during the year! Does your child love to be a rock star and see themselves on the big screen and internet? Well this is the perfect class for them! For this 10 weekend class we will be making a music video! From concept to completion your child will learn and participate in the movie making magic that will end in a film viewing on the big screen and to share with your friends on the internet! You’ll also learn acting for film, editing, cameras, creating special effects, props, set building and more! Does your child want to be the next Spielberg or Altman? Do they want to learn how to make fun YouTube movies with their friends? Well, this is the class for them! This introductory 10 week class will ease kids into the fun world film making with several movie making games and projects that will help teach children the fundamentals of movie magic. From how cameras work, acting for film, special effects, writing, editing & more. The class will end in a presentation of the mini movies for friends and family to come watch in the theater. Permission required – email Chanda Calentine before registering. * This is would be a prerequisite to the other advanced film programs. Lights! Camera! Action!! We are making a short film and your child can be a part of the cast & crew! In this 7 week course we will go through the writing, prop building, and costumes of the short film, then we will shoot using fun special effects and a brief introduction to editing. The class will end in a presentation of the mini movies for friends and family to come watch in the theater. Taught by Troy Burnette who has directed multiple films over his six years working at Tanglewood Summer camp. He studied at Full Sail Film School in Orlando, FL and The Art Institute of Atlanta. He has worked in Asheville for over 15 years on multiple projects including with Grammy winning Kid’s Hip hop artist 23 Skidoo in creating multiple videos. Troy believes strongly in getting as much input from the children as possible and teaches them what to do in front of the camera and behind it as well. He also writes and preforms two monthly shows with Super Happy Productions which he co formed with other ACT alumni. For general questions about classes or age requirements, please contact our Program Director Chanda Calentine at chanda@ashevilletheatre.org. For questions about the registration process or for questions regarding payments, contact Box Office Manager Joshua Runkles at 828-254-1320 or at joshua@ashevilletheatre.org. He is in the office from 10am until 4pm Tuesdays – Fridays.